You might remember that I put this book on my October reading list. And put it on my December reading list instead. Within the first few pages, I discovered that the story took place during winter break, immediately before Christmas, and that the inn was covered in a blanket of snow. Definitely December fare. As it turned out, the last 130 pages actually happen on Christmas Eve, and I just happened to read a big chunk of those 130 pages on Christmas Eve. I didn't purposely plan it that way, but my weird obsession with reading the right book at the right time was very satisfied. When Mike asked me what this book was about, I said, "Oh, it's a mystery. Middle-grade. Takes place during the holidays." And then after such a gripping description, I wondered why he didn't seem all that interested in hearing more about it. Hmmm, maybe it's because I didn't tell him that Greenglass House is an inn that usually boards smugglers (most of them smuggle really harmless things like house plants or ballpoint pens--the notorious Deacon and Morvengarde hold the market on just about everything, and so if anyone wants to buy anything at a decent price, it has to come from the smugglers). Maybe it's because I didn't tell him that Milo and his family own the inn, but it used to be the home of Doc Holystone (one of the more famous smugglers). When the story begins, Milo is just finishing up the last of his homework so he can enjoy the entire stretch of winter break worry free. The holidays are a slow time at Greenglass House, so he and his parents are looking forward to some quiet family time. But then (and maybe this would have helped pique Mike's interest), the bell rings, indicating that a guest is at the base of the mountain and waiting to ride the Whilforber Whirlwind (a single rail car that is one of the only ways to get to Greenglass House--unless you like to climb hundreds of stairs) up to Greenglass House. Milo is more than a little disgruntled about the imposition on his holiday, but things only get worse when the bell rings again . . . and again . . . and before he knows it, the inn is full of a strange mix of guests who all seem surprised and displeased to find more guests than just themselves there. 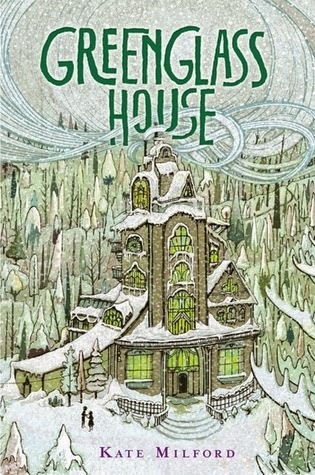 It soon becomes apparent that all of the guests have an unexplainable interest in the house, and so Milo and his friend, Meddy, invent a role-playing game to try to uncover the host of mysteries that exist in Greenglass House--things Milo would have never dreamed were a part of the home he had lived in his whole life. If that wouldn't have been enough to spark Mike's curiosity, then I hope it at least sparked yours because really, this a middle-grade novel worth reading. It's been getting some Newbery attention, and I'm really thrilled about that. The writing is fantastic, and it's a complex story with a myriad of little pieces that all (rather amazingly) fit together in the end. Towards the end, there's a pretty big reveal that I wasn't expecting at all. At first I didn't know how I felt about it, but it had been led up to really well (there were so many clues I should have seen but didn't), and it actually fit the mood and plot of the story really well. So in the end, I liked it, and now I won't say anything more about it because I would hate to spoil the discovery for anyone else. Another thing I didn't know if I was going to like was the role-playing angle of the story. When Milo and Meddy start discussing it and inventing their characters, it seemed like it was about to go in a direction that was a little too dangerously close to Dungeons & Dragons (something I know just enough of to know I don't want to know anymore). "Milo knew, of course, that no antique bric-a-brac in Greenglass House was even remotely likely to be connected to his own ancestry, even if it did have Chinese writing on it. Negret, on the other hand--Negret knew no such thing. Negret, he thought with a little thrill, could perhaps know the exact opposite. Through the game, Milo not only explores his feelings about being adopted, he begins to confront some of his fears and insecurities. Negret isn't shaken by unexpected circumstances. Negret is stealthy and observant. And pretty soon, Milo is all of those things too. However, I also loved a point in the story when Milo realizes that, as Negret, "he could call upon the exploit that would allow him to tell a perfect lie, but Milo discovered he didn't want to try the Fabulist out on his parents." It was nice to see him recognize his potential but also realize that, morally, there are just some things not worth doing and a trust worth building and maintaining. I've spent a lot of time in this review talking about Milo and his self-discovery, but the mystery is probably the bigger story (or at least takes up more time to tell), and it wouldn't be possible without a cast of truly fantastic characters who each have their own history and agenda. There's Mr. Vinge and Georgie and Dr. Gowervine and Mrs. Hereward and Clem and Owen. There are Milo's parents and Mrs. Caraway and Meddy. There's Fenster and Brandon and Doc Holystone. Each one made a contribution, without which the story would have been lacking a certain degree of suspense and intrigue. And then of course the house--I don't know what it was about the descriptions but I felt like I was literally walking through Greenglass Inn. Even now, as I'm writing it, I can see the green glass knob that led into the Emporium. I can see the poinsettia at the end of the hallway and the stained glass windows on each landing. I can feel the cold wind on the fire escape and hear the creak of the stairs. It was all so vivid and memorable--to the point that if I was all of a sudden dropped down on the front door, I think I'd know my way around it pretty well. This really was a perfect way to spend the holiday break. It's a book you can cozy up with and get lost in, and I'm excited to share it with my kids in a few years. Content note: there's a very little bit of mild language that you might want to be aware of if you're going to let a young child read it. I thoroughly loved reading this one, and hope it would compare to one of my favorite middle grade mysteries-The Westing Game. Not quite there, but a fun read anyway.